New York City’s Upper East Side in Manhattan, colloquially known as the UES, has it all; history, art, cuisine, charm, class and pizzazz! This neighborhood is bordered by 96st to the north, 59th street to the south, Central Park to the west and the East River to the east. The area was originally a minor stop on the Boston Post Road mail route that ran from Boston to New York in the mid-1600s. That minor stop, on what is today 86th and Lexington Avenue, grew into a trading post complete with inns and stables. Settlers came to this area in search of cheaper land and before long the area was dotted with prosperous dairy and produce farms. As early as the mid-1800s, small groups of German immigrants settled in the neighborhood. The early 1900s saw a dramatic influx of Germans moving north from the Lower East Side of New York City prompting residents to call the area Germantown and German was a second language. After WWI, a portion of Avenue A above 59th street was named after war hero Sargent Alvin York and a smaller, more concentrated portion of the UES became know as Yorkville. Editor’s Note: There aren’t many of these restaurants left on the Upper East Side. For an authentic taste of these restaurants, consider stepping into Heidelberg, a pre-1936 German eatery that is one of the oldest German restaurants in New York City. For Hungarian food, stop off at Budapest Cafe to sample the Hungarian pastries. Little by little the area evolved ethnically as more immigrants moved in until the area reflected the greater New York of the time with people from Germany, Hungary, Italy, Ireland, and other countries. Some of the remnants of the immigrant community are still evident today in the German, Italian, and Hungarian restaurants and bakeries that have been in the same locations for generations. Even today, you’ll find food from all over the world across the Upper East Side, so if you’re looking for something different, you’ll find it. Editor’s Note: Some food options on the Upper East to consider: Sarabeth’s for an amazing brunch, Laduree for macarons, Alice’s Tea Cup for a cozy high tea, and William Greenberg Bakery for black and white cookies (a NYC specialty), and H&H for decent bagels. Perhaps the most interesting residents on the Upper East Side were the fabled millionaires of the Gilded Age. The Gilded Age is generally considered to be between 1870 to 1910 and is synonymous with ostentatious wealth. The mansions of the industrialists such as Cornelius Vanderbilt, John Astor, Henry Clay Frick, and their families lined 5th Avenue to create Millionaire’s Row. The most spectacular of these was the mansion of Cornelius Vanderbilt II, where the Bergdorf Goodman department store stands today. It was demolished in 1926, but remnants of it can still be seen elsewhere on the Upper East Side. The intricately carved mansion gates now guard The Conservatory Gardens entrance at 100th street and 5th avenue. The fireplace can be found at the Metropolitan Museum of Art and a relief is displayed at the Sherry Netherland Hotel on 59th Street. There are over 100 museums in the city of New York with a large group concentrated in the UES. It is impossible to list them all, but we’ll be discussing some highlights of the Upper East Side with a note from Wanderlustingk editor. One mansion that is very much intact and converted into one of the finest museums in the country, if not the world, is the Frick Collection, the original home of Henry Clay Frick. The museum is so impressive that it is difficult to believe that it was once someone’s private home. Residents actually slept in these luxurious bedrooms and strolled the interior fountains and rose gardens… Can you imagine having a front lawn in front of Central Park? The Frick art collection includes Renoir, Gainsborough, Rembrandt, Titian, El Greco, Mane, and …3 Vermeers! All this glorious, spiritually uplifting beauty is accessible for pay-what-you-wish on Wednesdays from 2 to 6pm and totally free every first Friday of every month from 6 to 9pm except September and January. Another outstanding museum on Museum Mile, formerly part of Millionaire’s Row, is the Metropolitan Museum of Art. The MET had a pay-what-you-wish policy until March 2018 when it was replaced by admission that costs $25 per adult although students and seniors pay less. New York State residents remain pay-what-you-wish. The MET is quite possibly the finest museum in the world and would take you days to see in its entirety, so consider and select your exhibit preferences carefully beforehand. Be sure to check out the rooftop terrace for great views of New York! The Guggenheim is one of the most well-known museums in New York City. I recommend buying your tickets ahead if you’re visiting at a time that a major exhibition is opening up as the lines can go around the block. This stunning museum designed by Frank Lloyd Wright has pay-as-you-wish admission between 5pm and 7:45pm. I particularly love their collection of Picassos and there’s no doubt in my mind that this is one of the best art museums in the world. The Museum of the City of New York is a great museum to learn about the City of New York. Unlike some of the other museums, it’s not overly large, so you can enjoy its two sections, one focused on New York prior to the 1900s and one on present day New York. It does a great job of having thought-provoking exhibitions, so check for the upcoming exhibitions. The Asia Society and Museum is dedicated to traditional and contemporary Asian and Asian-American artists. The museum is a great place to learn more about different Asian cultures and to appreciate the work of groundbreaking artists. Admission is free on Friday nights between September and June. One of the most appealing features of the Upper East Side is that it is sandwiched between two great public parks. The first is the well-known nature wonderland that is Central Park with its reservoir, walking and bike paths, zoo, sports fields, little hidden castles, lakes, carousels, skating rinks entertainment venues and so much more. Make sure to bring a map into the park to appreciate everything it has to offer. The other park on the east side of the UES is the lesser know but equally beautiful Carl Schulz Park built in 1935. It is an oasis in the middle of busy, wonderfully frenetic New York City; peaceful, pretty, historic and bursting with color in the summer. These 15 bucolic acres of gardens and trees face the East River. Across the river you see Roosevelt Island and Hell Gate, the meeting of two bodies of turbulent waters. The passage was a strategic crossing point during the Revolutionary War. On the north side of the park is Gracie Mansion built in 1799. It was the museum on the city of New York at the beginning of the last century. Since then it has served as the home of New York’s mayors. Tours of the mansion are given on Mondays. Admission is $7 for adults, $4 seniors and students are free. The tour takes abut an hour and covers the history of the home and the park. One very enjoyable way to see the UES is with a walking tour; I recommend The Big Onion, New York City’s premier walking tour. A great selection for an educational and fun way to experience New York. Among their many tour selections is one for the Upper East Side conducted by knowledgeable doctoral history students. The tours cover the architecture, history, scandals, and gossip of the area supported by photographs depicting the past. Most tours are $25 for adults, $20 for seniors and $15 for students. This is a note by editor Wanderlustingk. If you’re a movie or television junkie, there are many filming locations around the Upper East Side. I can’t possibly cover them all, however I recommend looking into a filming locations tour. The most famous television show filmed all around the Upper East Side is Gossip Girl. 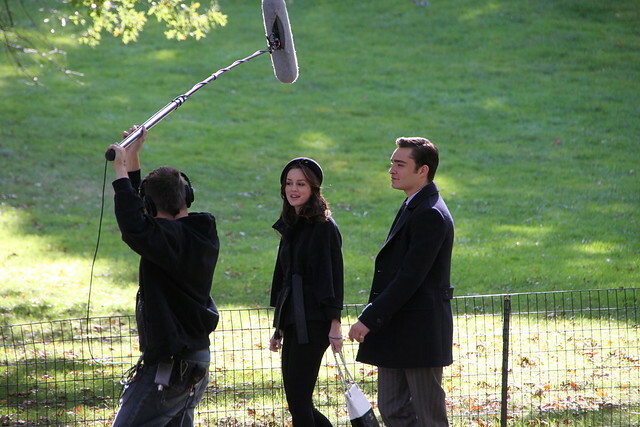 You can take a Gossip Girl filming tour if you’re a fan. Have you been to the Upper East Side?